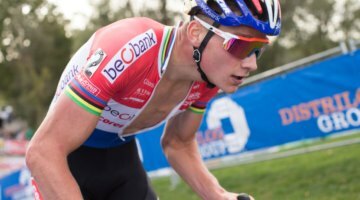 Mathieu Van Der Poel remained undefeated after his disappointing Worlds silver medal, taking an exciting, heavy 2017 Hansgrohe Superprestige Hoogstraten Elite Men’s race. The three 2017 Worlds medalists showed that flat tires or not, they’re still the three to beat. Despite not running much in training due to his surgically-repaired knee, Van der Poel showed sufficient running speed and unbeatable mud skills to pass Wout Van Aert in a tricky turn midway through the race and hold him and perpetual third place Kevin Pauwels off in the end. Watch the full race video below.